The votes have so far been counted at 96.6 percent of polling stations across the country. Greek Prime Minister, Antonis Samaras, has acknowledged defeat and congratulated Syriza’s leader, Alexis Tsipras, on the phone regarding his victory in the election, Reuters reports. "Greece leaves behind catastrophic austerity, it leaves behind fear and authoritarianism, it leaves behind five years of humiliation and suffering," Tsipras told thousands of cheering supporters at a rally in Athens. "The Greek people have spoken and we all respect their decision. I have a clear conscience," Samaras said in a televised statement. "New Democracy will remain ready to play a decisive role in future developments, as the guarantors of the country's European course." Meanwhile, the leader of the country’s right-wing Independent Greek party, Panos Kammenos, has confirmed he is willing to form a coalition with Syriza. Kammenos said he has called Tsipras to congratulate him and to offer his party’s support for Syriza’s anti-bailout policy. Independent Greek is set to gather just under 5 percent of the vote. 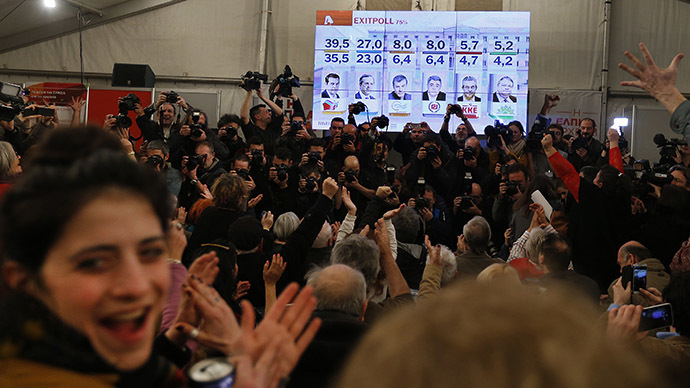 The exit-polls earlier revealed that Syriza, has won between 35.5 and 39.5 percent of the vote in the national parliamentary election, leaving the New Democracy party more than 10 per cent behind. Good illustration of how far behind Syriza the others will be, MP-wise. "@ALPHA_TV: Exit Poll #ekloges2015pic.twitter.com/KeJgu1HGel"
The results of the exit polls were announced right after polling stations across the country closed at 1700 GMT. The first official results have been announced at approximately 1920 GMT, with the outcome of the vote to be finalized on Monday morning. Centrist party To Potami (The River) and the far-right Golden Dawn party are in tight competition for third place, with both attaining 6.4 to 8 percent of the vote, according to a joint poll by Metron Analysis, GPO, Alco, MRB, Marc. Syriza (Coalition of the Radical Left), which is headed by 40-year-old Alexis Tsipras, rose to popularity after it promised to renegotiate Greek debt and put an end to austerity in the country. In Greece, a political party requires between 36 and 40 percent of the vote in order to secure an outright win, with the exact figure depending on the share of the vote taken by parties that failed to pass the 3 percent threshold required to enter parliament. According to the exit polls, seven parties are on the way to making it into the new Hellenic Parliament, which is comprised of 300 MPs. The election was held earlier than scheduled because of the failure of the parliament to elect a new Greek president on December 29 last year. The presidential candidate presented by the government, Stavros Dimas, had failed to secure the required majority votes from MPs across three rounds of voting. This means that Syriza will occupy between146 and158 seats in the Greek parliament, while New Democracy will likely have to settle for between 65 and 75 seats. One hundred and fifty one seats are required for a party to form a government on its own. “It is a historic victory, we still have to see if it will be a big historic victory. It sends a message against austerity and in favor of dignity and democracy,” Panos Skourletis, Syriza spokesman, told Greek Mega TV. A senior New Democracy party member, health minister Makis Voridis, has conceded defeat to Syriza in the elections. “We lost. The extent of that result is not yet clear,” Voridis told Mega TV. If the results of the exit polls are officially confirmed, Syriza will become the first ruling anti-austerity party in Europe.